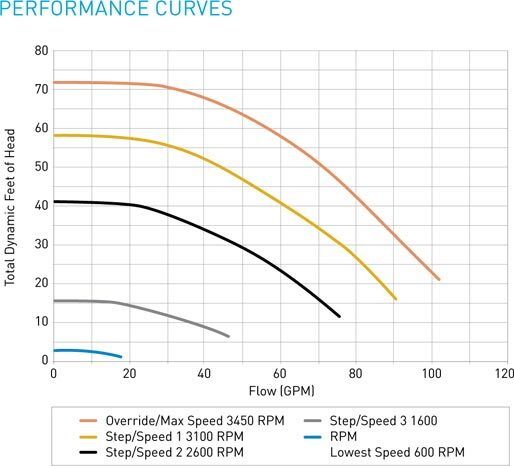 Now that Pentair has combined the affordability and replacement ease of this innovative new pump with 115/230V capability and energy savings up to 80%, your opportunities for pool pump upgrades have increased enormously. Add in a real-time, 24-hour clock and an advanced digital keypad, and you'll agree SuperFlo VS is the most versatile replacement pump in its class. Only variable speed on the market today with 115/230V capability. old pump quit. variable speed pumps will be required in 2021. Trying to save $ on energy costs. Recommended by pool maintenance person plus $350 rebate from Ameren Missouri. Energy efficient and it is 115-230 v configuation. This product had excellent reviews. It seems to fit the need, least expensive with decent reviews. This pump is very good & saves money..
Great reviews and great price!! better price than the other website pool stores. Recommended by my pool service technician. Pentair is much quieter and longer lasting than other equipment on the market, and it is designed to work with external controllers, a lot of them will not allow external control. My pool guy told me this is a good one to replace my burnt up Hayward pump. This pump is 115Volt,,1-1/5 in threaded inlet & outlet that will accept threaded pipe that was from original setup. This is best pump @ 1-1/2 HP to push water to the solar panels on 2nd floor roof.The 3 speeds will do what I want it to do to move 18,000 gallon inground pool & 100 sqInch cartridge filter. To save on ele bill. And have control over speed and times to set. Chose this for energy savings and value. I spoke with Stan your phone technician on Saturday and he was very detailed explaining the product and it;s functions. The Rebate and potential savings. Stan is a good man. A friend of mine has same pump and stated it's a great product and can really see the difference in electrical bill. Also states it's super quiet and effiecient. What size pool is this pump for? BEST ANSWER: My pool is small. 15,000 gallons. My previous pump was 1 hp and worked OK. I bought this pump and compatible filter to ensure good circulation and filtering. I am very happy with this pump and would recommend it. 20,000 gallon vinyl lined. It works great using the recommended settings. I also have a salt chlorinator and it keeps the chlorine at the correct level even on the low speed. Highly recommend it. 10,000 gallons and no spa. I have an inground 22K gal pool. Currently have an old single speed 2hp pump with 2" piping. Will this VS pump be a good replacement? BEST ANSWER: Very probably. The fittings were very easy to connect to 2" pipe work. Ours is a 15K pool, replaced a 1.5hp pump single speed with this. Even if you're going down in HP, you can run slower and longer and save money. My pool isn't quite as large and I cannot speak to the size of the pipe. I love the pump! It's relative quiet. It was prett easy to instal (with my brother's help) I also got a nice rebate! All in all I am very happy with my choice. I bought a variable speed pump 6 years ago to replace a single speed pump, it is quite and saved me on average $30.00 a month or over the last 72 months that $2160.00 in my pocket not the electric company. Does this come with the wire kit or do I buy it separate? BEST ANSWER: Do you mean the wire kit for relocating the control panel? If so no. For power I used the existing electrical connections. The pump needs to be professionally installed to a rated disconnect- does not come with external wiring. No wiring included, but it does come with the pipe flanges, which is a big plus. Wiring is seperate. I was able to use my existing wires. Fantastic pump. Besides Pentair 342001 pump, do i need an additional valve (flow control) to qualify for CPPR Rebate ($1,000)? BEST ANSWER: My understanding is that variable speed pumps offer better energy efficiency than fixes speed pumps with flow control valves. Imagine a "fixed speed car". Accelerator fixed to the floor (max), and you use the brakes to control the speed :-) A variable speed pump is like a sensible car. It allows you to slow down by letting off the gas. The utility rebate for variable speed pumps are honored by your utility company. Please contact your utility company and verify the requirements for the rebate, as some utility companies do not participate in the program. I have an Aqualink link system that i set my times for my pool to turn on and off. Will this pump communicate properly with Aqualink or will it override it? I have an in ground 16'x36' approx. 27000 gals I believe. Is the Pentair SuperFlo VS Energy Efficient Variable Speed Pool Pump | 1.5HP Single Phase 115-230V 50-60HZ | 342001 the best energy saving Pentair pump for my pool? BEST ANSWER: Sorry had the pump away for winter in the shed. I run 230v with 2x 1.5" suction lines and 1.5" discharge to split jets. Inground, 2.7cu/ft sand filter, hayward 6 way valve, something like 18.5k-20k total gallons. I am wire at 230V. The pump draws about 2150 W during prime cycle, 1900 W on high speed. 1400 W on medium and about 700 W on low. Ihave a jandy model #phpu1.5 with 2" male connectors what are the dementions for connections can't find in manual, will it fit without much problem? thanks. BEST ANSWER: I have a 10K indoor pool and currently run the pump at speed 3 (medium) for 3 hours a day when heating the pool otherwise I run it at speed 2 (low) 24 hours a day. I only use speed 1 (fast) when vacuuming the pool. So it should easily handle a 16K pool. my old pump was 3/4 HP and I'm saving about $40/month in electric with this pump over my old 3/4HP pump. The old pump ran 24Hours/day at full speed. Current electric rate in for me in KY is 8.795?/kWh. I had the same pump with 15k in California. I am very happy with the new pump. Much quieter and efficient. I think you'll be happy with it. WHich model did you purchase? 342000 or 342001? Absolutely, this pump is easy to program and has cut my energy cost significantly. Hope this helps. Yes. We are happy with it. does this include a skimmer basket on it? The pump inlet contains a basket. to screen debris from entering the pump impellor. You have the Pentair SuperFlo VS variable speed pump listed for $615.00. This pump is eligible for the Edision rebate. Does Pool Supply Unlimited take the rebate directly off the price of the pump or do i have to request the rebate directly from my utility company? I believe, if memory serves me correctly, that I had to send proof of purchase to the utility company. They sent a representative to calibrate/set it. Hi, Does the communication cable come as standard component with this pump, the SuperFlo VS, p/n 342001, or you have to buy it separately? Thank you. BEST ANSWER: It is separate. I wish I had purchased it. My pump is in a pump house and it would be easier to control it closer to the pool. Thank you very much, John. Ami. I don't recall a communication cable. I think you purchase that separately. My pump runs standalone. I just lift the lid to access the built-in control panel. Awesome pump! The communication cable did not come with my pump and needs to be purchased separately. No it does not come with the cable. I believe you need to purchase it separately. how will the rebate portion work if i install? BEST ANSWER: Hmm. I don't remember using a rebate, but this pump is worth the price even without a rebate. In fact it is even cheaper than when I got it if I recall correctly. Used for about 2 years so far, and it is still quiet, powerful, perfect! Sce gave me the option of a check for $200 or a $200 credit toward my monthly electric bill. If you are a licensed electrician or hire an electrician then it doesn't affect the rebate. Do you have to run this pump for 24 hours a day? No, you can adjust the length of the 3 set points and leave time for a break. I typically have it cycle off at night. can this pump be hard wired ? BEST ANSWER: I don't see why not as long as you put it on a ground fault breaker. Yes. In fact, I don't think you have a choice. It is a hard wired pump. Not a plug in model! is their a cover for this pump? BEST ANSWER: Yes, over the controls of the pump is a hinged metal cover that both diverts water or protects it from any item falling on it. I suppose it keeps the sun off it as well if used outside of a pump room. Had the pump over a year now and wish I got it sooner. If you wish to cover it, any traditioanal cover could be used. What do they mean by saying the time control is not exposed at installation? There is a cover over it, it helps to protect it. The controller on the motor has a cover. What size filter should I have with this pump so that it's effecient as possible? BEST ANSWER: I am using a Sta-Rite S8M150 on a 22,000 gal. Salt Water pool with a Pentair 1.5 hp variable speed pump. My water is always crystal clear. I like the fact that it's super easy to clean the cartridge filters, I take them out and hose them off once a month. My original set of filter cartridges lasted 10 years. We have a inground pool 22,000 gallon with a Hayward 300 lbs sand filter. on my electric bill running this pump, love it ! BEST ANSWER: Are you asking what does Hp (Horse Power) mean or what is the Hp rating of this pump?
" 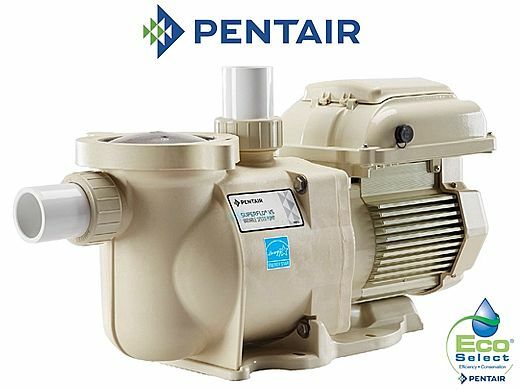 Pentair SuperFlo VS Energy Efficient Variable Speed Pool Pump | 1.5HP Single Phase 115-230V 50-60HZ | 342001"
does this have a low flow cut off in case the water level drops below the skimmer in the pool so as not to burn up the motor? My existing pump is located in a tight equipment room that will make the control panel upside down and hard to read. Can the control panel be a few feet up on the wall? BEST ANSWER: Pentair does not make a cable for this to relocate and unfortunately there is no way of removing it for better viewing. The only way would be to re plumb it to a different location. If Pentair makes a cable that you can remove panel from pump and mount on wall. I would probably redo the plumbing so it can be read. If??? Do they make such a cable? What is the current draw at speed 3 / 1600RPM? BEST ANSWER: Correction to my original answer. My pump draws about 1400 W on speed 3. 690 on speed 2. Mine is wired for 230V and it draws about 690 watts at speed 3. Will this work on an above ground pool? I have a 27 ft. x 4 ft..
BEST ANSWER: This pump is designed for an in ground pool but you may be able to use it in an above ground. You would need it hardwired into an automation unit or time clock and it would need to be on a lower setting. It sure will. I have a 16x34x9 inground and I'm pumping water up to the roof through solar panels. Can this pump be used with salt water? BEST ANSWER: Yes it can, we have a salt water pool and it works great. I have a 25000 gallon pool with a Hayward sand filter (500) pounds with a Hayward super pump single speed pump. I have 1.5 inch pipe and my fiter has a 98 gpm flowrate. Would this be the best choice or can I go with the 3 hp unit? BEST ANSWER: Hi there. You really don't need 3 hp pump for the job. 1.5 hp is sufficient enough. Keep in mined the larger the pump the more it will consume energy. I would recommend the Pentair SuperFlo pump based on the variables that you included above. i have a challanger pump on my 30,000 gal pool how does this pump hook up to my system? BEST ANSWER: Not sure I fully understand the question, but usually the pump draws in water from the intake with the basket (side) and pushes water out of the outlet (top). Water goes from main drain ==> pump ==> filter ==> water return or water features. The pump is self priming. Mine is mounted about 1.5 feet above the water line with a check valve. It sits directly on a concrete slab open to the elements for 2 years. I cannot advise on the size of the pool, you need a pool supply expert for that. Hope this helps. Thank you Colin. The SuerFlo would go in the same spot as the Challenger pump. the plumbing on the Superflo is 1.5" but can also be connected to 2" plumbing with the provided unions. The control box on the pump is used instead of your mechanical timer. You can take it out and splice the wiring or just take the triggers out of the timer so that it is always on. Which sand filters work best with this pump? I currently have a Hayward and it seems to be overwhelming it. None of your materials outlines which filters work best. "overwhelming"= water flow is so intense that it pushes up the valve causing the flow to work incorrectly, also, filter doesn't seem to work because the flow is probably creating clear channels thru the sand and so not filtering anything. what times do I set a 12 hour cycle? I like to run mine from 6 AM to 6 PM. You have this pump listed under OTHER PURCHASE OPTIONS as $625.14. Is this true? can i direct swap this unit for a single speed pentair superflow without re-piping? BEST ANSWER: Hi there, I’m no expert but have a good working knowledge of pool plumbing. I would say yes, this works as a direct replacement. In fact, that’s the exact pump I replaced. I’m not joking when I say we saw an immediate $30-40 per month drop in power bills. The only thing odd we had to do is have a professional licensed installer put it in because the power company here gave a great rebate, but only for professional installation. Worked out great. My monthly electric bill has dropped about $40 per month. Pump is virtually silent and pool is sparkling clear. Easy installation, works great and is quiet. I had the local electric company come out to check it for a rebate and they said it could run for 10 hours for the same power as the old 1.5hp pump used in 2 hours. It's easy to change the programming, I would buy it again! This pump primes well, runs quietly, and moves lots of water efficiently. Mine has been running on automatic for the last 2 years, and it still purrs beautifully. 2 inch pipes pushing water through a large cartridge filter. The fact that it can do this on 110V single phase (like ordinary plug in current your toaster uses) was a big win for me when selecting it for my project. You can use the up/down arrows to change the RPM in very small increments, and watch the power consumption in watts on the LCD as the speed changes. Way Cool for the geek in me !!! (Played with it for days :-) This feature allows you to tune very large water features perfectly in the most energy efficient way. Has reduced my electric bill significantly, easy to program. Stan ( the sales person) was incredibly knowledgeable and extremely helpfull , had all the answers and made my expierence really great .i'll do more business with you because of him. Very happy with this pump, easy to program. This pump is very quiet. Shipping was fast. I have this pump for about 3 months. It has decreased my electric bill substantially. I had to play with the automatic chlorinater to get the chemicals adjusted just right. Variable speed is the way to go. Have only owned it a short while, but so far so good. Very quiet at lower speeds, In fact at around 1400 RPM or lower we can hardly hear it. can be programmed fairly easily. Quick delivery, easy install. At the lower RPM's it is very quiet. I have not yet installed as I was having other pool issues. The product seems to be just what I wanted. Only one issue- I paid $691 before rebate and now, just 2 weeks after delivery, you advertise same at $649 plus $50 rebate. I guess I should have waited. This unit is a replacement for a 1.5 Hp pump that finally gave up the ghost. I did the install myself and it was a synch. The only issue was the height difference between this unit and my old StaRite. I've had to change my pool cleaning routine with this pump. going into the low flow mode does not allow the pool vac to operate so I've switched from leaving my Barracuda G3 in place with no skimmer action to skimming and a manual vacuum once or twice a week. The extended run time at low speed has kept the water very clear. I have no screen so debris can get into the pool fairly easily. We'll have to see if the manual vac gets too old too fast. This older 1960s home needed a replacement pool pump. Your Pentair "Superflo" VS was a perfect upgrade & match! Hookups were "a breeze" and the efficiency was just what I was looking for! I highly recommend the "VS" for pool pump replacement! My installer told me to look at both the 342000 and the 342001, so I got on the PSU chat and asked what the difference was and the agent stated that the 342001 had an option of connecting on 155-230V while the 342000 was only 230V. Seriously, Im glad I got on and asked. Two weeks in and all it running well. Best price on the web, but still not cheap. PSU was great with customer service. So far very happy with our new variable speed pool pump. Hoping to save on electric bill and it is so quiet. Price plus a rebate was a very good deal. Very easy install. Seems to work great. Arrived quickly and in great shape. Definitely would recommend. Once U master the variable speed controls & timers you will be pleased with the efficiency. Awesome pump, easy to install and easy to setup.I am very happy with the results. Would recommend both the pump and poolsupplyunlimited.com. The only drawback is to get the warranty, it has to be professionally installed. I recommend this pump !! Efficient and quiet.. Installed it myself. my energy bill has been reduced significantly and pump is as quiet as can be.Write your review here. It must be at least 50 characters long. Consider whether you would recommend this product and what you like or dislike about it. We had it installed and so far so good and the process of ordering and receiving was awesome. It's everything it is suppose to be. It was a good clean install and very easy to program. It's running like a champ. After a few attempts at programming , the pump is running smoothly and turning 'off' and 'on' at the selected times!!! The best pool pump there is if you have a 110. Save massive amounts of electric. Had this shipped from Pool Supply Unlimited from CA to FL and still destroyed my local pool companies price as well as all online competitors. Thank you! As a professional technician, it was easy to install and program. Very quiet during all modes when running. Great pump for the price. Already noticed cost savings. I really like this pump and filter. Easy to program and after a couple days found what works for my needs. I would recommend this set up to others hands down. I replace a 15 year old single speed pump with this. It is amazling quiet compared to my old Challnger. The noise from the pump is nonexistent unless it is running over 3000 RPMs and even then it is a fraction of the thunder the old pump made. I love the control panel. Easy to use, easy to program. The only thing left is to see the electric bill. I think I will be very pleased as the old pump had become so inefficient that I was spending hundreds on dollars churning water ant I had to manually turn the pump on an off to conserve electricity. I also love the start and stop button on the pump. No more throwing the main pool panel breaker to service the filtration system. Super easy to operate. The energy savings are incredible. This is by far the best investment I have made since installing the pool. Love it. Very happy I made this purchase. Great product and the team at Pool Direct Unlimited was very helpful in answering and questions I had. Very easy to install and set up. I am waiting on the next electric bill to see the improvement. Also got it about $500 less than what the local pool supply in Florida was charging. works like a dream, don't know why I waited so long to switch. The savings are night and day from my prior 1 phase pump. First thing I noticed was how quiet it is, my pump is only 10 feet from my patio and I have found I actually have to look to make sure it's running it's so quiet. I have it programmed to run at high-speed on-off use times. My pool water has never been cleaner, it runs 24-7 at half the cost of my old single speed pump. I highly recommend this pump. This is a great product.Runs quiet,cleans my pool great.Not to hard to program.Would reccommend this. The pump was working good until we had thunder and lightning 2 days ago pump hasn’t worked sense. I believe the computer not working.